Maximum size: 4 mm (Kay, 1979). 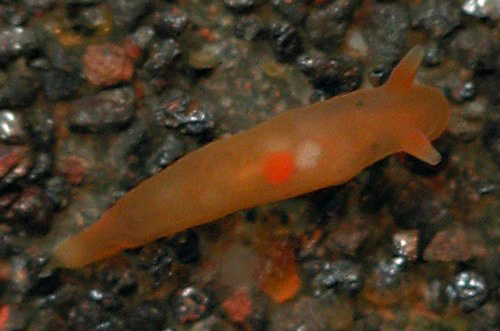 Identification: This is a tiny, bright orange species with a soft body and no gills. Natural history: Although seldom noticed due to its small size, Vayssierea felis is a moderately common species. We've found it under rocks in the mid to low intertidal on cobble beaches, in moderately protected to moderately exposed rocky areas down to 5 m (16 ft) and in Halimeda kanaloana beds down to at least 11 m (36 ft). It feeds on spirorbid and serpulid polychaetes by boring through their tubes (Kay, 1979). Unlike in most Hawaiian nudibranchs, the eggs develop directly and are proportionately large, for the animal, with unlaid eggs often showing through the body wall as orange masses. A 1.8 mm animal laid an arc-shaped mass of seven eggs that hatched in 13 days in the laboratory. The freshly hatched juveniles were about 0.8 mm in length. Taxonomic notes: This is the species listed as Okadaia elegans Baba, 1931 in Kay, 1979 as well as Kay & Young, 1969. It was first reported from Hawaii in Kay & Young, 1969. Photo: CP: 1.7 mm: Honanana, Maui; July 8, 2005.